Elizabeth Denby studied Social Sciences at University and through this became interested in housing. In 1932 she organised the first 'New Homes for Old' exhibit at the Building Trades Exhibition at Olympia and London. Between 1934 and 1935 she held a Leverhulme Research Fellowship in order to investigate low-cost housing in Europe. Denby met the Modern Movement architect, E. Maxwell Fry, at a party and began productive collaboration with him, in which she advised on, and promoted, his architectural schemes. One example was a pioneering block of flats at Kensal House, North Kensington, London. Denby's influence was evident in the provision of extensive social facilities, including a nursery shcool, and a social club, complete with library, women's room for sewing and men's room for joinery, furniture and model making. In 1936 Denby became the first woman ever to address a meeting of the Royal Institue of British Architects. The subject of her paper was 'Rehousing from the Slum Dweller's Point of View'. It was not well received, since Denby advocated high density development of small houses with gardens. This ran counter to the ideas of both the champions of the Garden City Movement and the Modernists who were in favour of high-rise apartment blocks. The speech also incurred the wrath of the Women's Committee of the RIBA, who thought that a woman architect should have been invited to speak. Denby's expertise on housing matters was drawn upon by government bodies, notably the Council for Art and Indutry (CAI). She was involved in the publication of the CAI reports on 'Education for the Consumer' (1935), 'Design and the Designer in Industry' (1937) and the 'Working Class Home; Its Furnishing and Equipment' (1937). The results of all her research into housing were published in her book, 'Europe Rehoused' in 1938. Elizabeth Denby established herself as an important adviser on housing and architecture. Although she was not what would conventionally be defined as a designer, her influence on design was extensive and long lasting. Dorothy Braddell was also involved in the CAI report on the working class home, as an adviser on domestic planning. She was widely known both as a designer and a writer. Her husband, Darcy Braddell, was an architect and she often worked under his name. She had begun her career as an illustrator, but came to specialise in kitchen and appliance design and the installation of exhibition stands. She worked as a consultant for the Aga company, which manufactured cooking stoves. Among a number of important commissions was a series of road signs for Shell, which were part of their campaign to improve the visual quality of British townscapes. 1. Farmhouse kitchen redesigned by Dorothy Braddell, illustrated in the 'Studio Yearbook' of 1936. 2. Parkinsons Gas Stove, styled by Dorothy Braddell to be included in the Ideal Home Exhibition of 1935. It was made from cast iron with pressed steel sheets enclosing the structure. It was also shown at the Royal Academy exhibition of 1935. 3. Kensal House Flats, Ladbroke Grove, London. Completed in December 1936. The team of architects included Robert Atkinson, E. Maxwell Fry, G.A. James and G. Grey Wornum. Elizabeth Denby was the Housing Consultant for the scheme (2 images). 4. 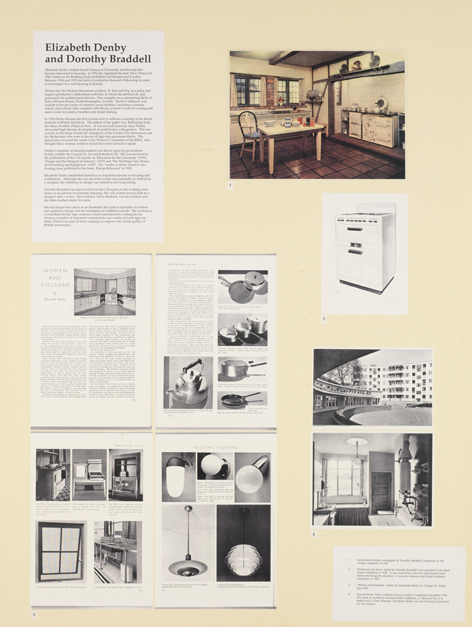 'Women and Kitchens' written by Elizabeth Denby for 'Design for Today', July 1933 (4 sheets).